As one of the most popular tourist destinations in West Africa, Ghana has something for every kind of traveler. From its cosmopolitan capital to historic cities steeped in Ashanti culture, the country is known for its urban flair; while its parks and game reserves are filled with exotic wildlife. On the coast, secluded beaches are interspersed with forts that serve as a reminder of Ghana's tragic role in the slave trade. This is one of the region's wealthiest, most stable countries - making it a great starting point for first-time visitors to Africa. Ghana is located on the shores of the Gulf of Guinea in West Africa. It shares land borders with Burkina Faso, Côte d'Ivoire and Togo. With a total area of 92,098 miles/ 238,533 square kilometers, Ghana is similar in size to the United Kingdom. The capital of Ghana is Accra, located on the country's southern shore. According to July 2016 estimates by the CIA World Factbook, Ghana has a population of almost 27 million people. Akan is the largest ethnic group, accounting for approximately half of the total population. English is the official language and the lingua franca in Ghana. However, around 80 indigenous languages are also spoken - of these, Akan dialects like Ashanti and Fante are the most widely used. Christianity is the most popular religion in Ghana, accounting for 71% of the population. Just over 17% of Ghanaians identify as Muslim. Ghana's currency is the Ghanaian cedi. For accurate exchange rates, use this currency converter. Thanks to its equatorial location, Ghana has a tropical climate with hot weather all year round. Although temperatures vary slightly according to geographical region, you can expect daily averages of around 85°F/ 30°C. The wet season generally lasts from May to September (although in the south of the country there are two rainy seasons - March to June, and September to November). The best time to visit Ghana is during the dry season (October to April), when precipitation is limited and humidity is at its lowest. This is also the time of year with the least mosquitoes, while unpaved roads are usually in good condition. 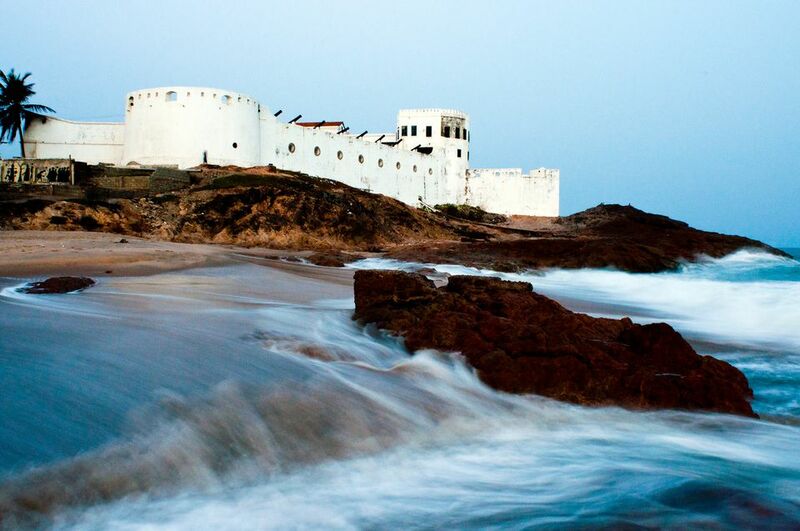 The whitewashed castles at Cape Coast and Elmina are the most impressive of Ghana's remaining slave forts. Built in the 17th and 15th centuries respectively, both served as holding stations for African slaves en route to Europe and the Americas. Today, castle tours and museum exhibits offer an emotional insight into one of the darkest periods of human history. With a reputation as one of the safest capital cities in West Africa, Accra is a bustling metropolis known as much for its traditional culture as it is for its music scene, restaurants and nightclubs. Top attractions include colorful Makola Market (a great place to shop for souvenirs); and the National Museum, home of Ashanti, Ghanaian and slave trade artifacts. Located in southern Ghana, Kakum National Park offers visitors the chance to explore a tract of unspoiled tropical rainforest filled with fascinating animals - including rare forest elephants and buffalo. Over 250 different bird species have been recorded within the park, and there's an excellent canopy walkway measuring some 1150 feet/350 meters. As Ghana's largest national park, Mole is the top safari destination for visiting wildlife lovers. It is home to elephant, buffalo, leopard and the rare roan antelope. If you're lucky, you may spot one of the park's recently re-introduced lions, while the birdlife here is also fantastic. There are options for vehicle and walking safaris under the supervision of a local guide. Located in Accra, Kotoka International Airport (ACC) is Ghana's main gateway for overseas travelers. Major airlines that fly to Kotoka International Airport include Delta Airlines, British Airways, Emirates and South African Airways. Visitors from most countries (including those in North America and Europe) will need a visa to enter the country - check this website or consult with your nearest embassy for further details on requirements and processing times. As well as ensuring that your routine vaccines are up-to-date, you will need to be vaccinated against yellow fever before traveling to Ghana. Anti-malaria prophylactics are strongly recommended, as are vaccines for Hepatitis A and typhoid. Women who are pregnant or trying to conceive should be aware that Zika virus is a risk in Ghana, too. For a full list of medical requirements, check the CDC website.